Cytomechanical measurements are important to unravel the influence of the biochemical composition of the plant cell wall on growth, morphogenesis, and stability. Agronomical research has a great interest in cell wall mechanics because in an ideal situation, crop plants grow as fast and large as possible without loosing the strength to withstand destabilizing environmental influences. Pollen tubes provide a convenient system to study major aspects of cytomechanics. They grow extremely fast but expansion is restricted to the tip region, providing a cellular model where both biochemical and mechanical properties vary spatio-temporally along the cell. The path of the pollen tube from the stigma to the ovary is full of obstacles, which the pollen tube has to overcome to reach the ovule and achieve fertilization. Once an obstruction is sensed, it can be either circumvented or penetrated, which involves mechanosensing, signal transduction, internal physiological changes, and adaptation of the mechanical properties of the pollen tube. As a result, the pollen tube changes its growth direction or increases the pushing force, both of which are controlled by a fine-tuned interplay between turgor pressure and cell wall extensibility. 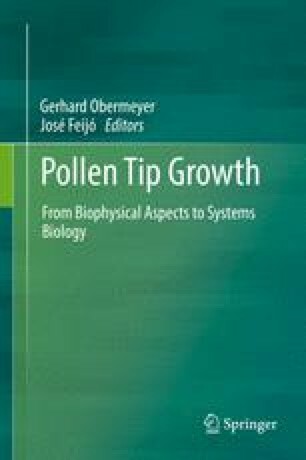 In this chapter, we provide an overview of state-of-the-art methods to measure those two parameters, as well as an outlook on novel technical developments that will allow the precise evaluation of the mechanical properties of the cell wall along the length of the pollen tube.